Where do you start when you want to improve your internal control environment? 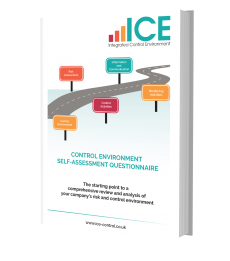 Download our Control Environment Self-assessment Questionnaire today as the starting point for a comprehensive review and analysis of your company’s risk and control environment. The questionnaire is based on the model devised by COSO (the Committee of Sponsoring Organizations of the Treadway Commission), the globally-recognised body dedicated to risk management and internal control. It contains over 200 questions to help you critically appraise your company’s current control environment, reflect on what is operating well, and devise a plan of action for improvements going forward. These questions offer a first step to understanding and improving your organisation’s internal control. The key is to then analyse the results and determine where your company has specific areas of weakness and what actions need to be taken to improve your control environment. To find out how other organisations have benefited from using ICE Integrated Control Environment, read our Case Studies.